Prepare for the zombie invasion with the zombie disguise shirt! Pop this on and you'll blend right in with the walking dead. they'll think you're one of them! We also recommend wearing this for Halloween, to parties. really any event you can think of. Have you tried a Crazy Dog T-shirt yet? Just Wait until you slip on one of these super soft tees. You'll instantly fall in love! Not only are they printed on super soft cotton but the tees fit great too. Try one and you won't go anywhere else! With over 900 designs Crazy Dog is the online destination for your favorite tees. Many of our designs are available in mens, womens, and youth sizes and come in a variety of different colors. Check our store to see them all! Each T-shirt is officially licensed, and brand new. A must have for any fan of the living dead! Zombie Apocalypse t shirt is here! Choose your weapon shirt is perfect zombie shirt everyone loves! Those left for dead fans and dawn of the dead followers know what to do when the inevitable zombie attack comes. Get your weapon ready. Smash some heads in and you will cure the infection one bullet at a time. 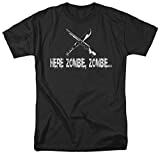 Black shirt, with neon orange writing, add this funny tshirt to your collection of zombie t shirts. Perfect for all of the walking dead fans. Have you tried a Crazy Dog T-shirt yet? Just Wait until you slip on one of these super soft tees. You'll instantly fall in love! Not only are they printed on super soft cotton but the tees fit great too. Try one and you won't go anywhere else! With over 900 designs Crazy Dog is the online destination for your favorite tees. Many of our designs are available in mens, womens, and youth sizes and come in a variety of different colors. Check our store to see them all! 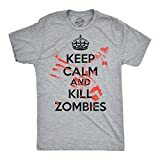 Officially licensed men's Walking Dead sublimated tee shirt. Features a character panel and logo on the front with a white back. The sublimation process can result in imperfections and white streaks, particularly along seams and folds. Made from 100% polyester. Keep Calm and Aim for the Head t shirt. Get your walking dead shirt here. Have you tried a Crazy Dog T-shirt yet? Just Wait until you slip on one of these super soft tees. You'll instantly fall in love! Not only are they printed on super soft cotton but the tees fit great too. Try one and you won't go anywhere else! With over 900 designs Crazy Dog is the online destination for your favorite tees. Many of our designs are available in mens, womens, and youth sizes and come in a variety of different colors. Check our store to see them all! Welcome the walking dead. Weathered slogan with weaponry graphic on a grey t-shirt. Sizes M-XXL 100% cotton T-Shirt or a 50%/50% cotton poly Sweatshirt. Printed in the USA on imported shirts. 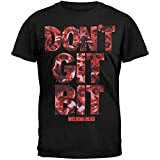 Wicked Tees officially licensed new mens DAWN OF THE DEAD WALKING DEAD t-shirt tee. This novelty tee is color BLACK. Standout from the crowd in this 100% officially licensed DAWN OF THE DEAD shirt. This premium Round Neck tee is made in the US and printed on demand so that your DAWN OF THE DEAD WALKING DEAD t-shirt color BLACK is guaranteed to fit right and look right every time you put it on. We are an officially licensed company in the USA and aboard to sell this DAWN OF THE DEAD WALKING DEAD design. When you buy a shirt through us, you're getting an authentic, officially licensed mens DAWN OF THE DEAD Round Neck shirt is guaranteed to look and fit great. About Wicked Tees - Wicked Tees is a leading internet t-shirt tee retailer with hundreds of thousands of licensed t-shirt tees for you. We have thousands of T-shirt tees for popular TV shows, movies, superheros super hero, pop culture and classic brands apparel. We offer hundreds of styles of shirts including tank tops, v-necks, slim fit, baby onesies one piece, ringer shirt ringers, heathered heather shirts, long sleeve shirts, womens t-shirts, mens tees and new sublimation tshirts. We start by sourcing the best feeling, best fitting, highest quality t-shirts for our stock. From there we use either our cutting edge print-on-demand technology or classic offset silk screen printing to bring you the freshest styles and coolest designs for all ages. Officially licensed The Walking Dead I Heart Daryl tee shirt with wings. Shirt comes in black with white wings on back and I Heart Daryl text on front in white. Shirt is made with 100% cotton. Zombie Apocalypse t shirt is here! Choose your weapon shirt is the perfect zombie shirt everyone loves! Have you tried a Crazy Dog T-shirt yet? Just Wait until you slip on one of these super soft tees. You'll instantly fall in love! Not only are they printed on super soft cotton but the tees fit great too. Try one and you won't go anywhere else! With over 900 designs Crazy Dog is the online destination for your favorite tees. Many of our designs are available in mens, womens, and youth sizes and come in a variety of different colors. Check our store to see them all! Men's black Fear The Walking Dead tee shirt. Made from 100% cotton, this shirt features a Fear Begins Here logo on the front. Officially licensed. From Ape to Man to Zombie, this lays out evolution the way it will play out over the next decade or so. it's like getting a secret glimpse in to the future, assuming you've accepted that we'll all evolve in to Zombies (we will). This vintage looking zombie design is screen in red and black with a distressed print on a white tee. perfect for keeping track of all the wounds you'll accumulate in the final zombie battle! Have you tried a Crazy Dog T-shirt yet? Just Wait until you slip on one of these super soft tees. You'll instantly fall in love! Not only are they printed on super soft cotton but the tees fit great too. Try one and you won't go anywhere else! With over 900 designs Crazy Dog is the online destination for your favorite tees. Many of our designs are available in mens, womens, and youth sizes and come in a variety of different colors. Check our store to see them all!